All avatars must be 80 x 80 pixels and no larger than 6K. They can be in .gif, .jpg or .png formats. You can post them here, they will be reviewed and submitted to the avatar gallery. I have enabled uploading your own avatar in the profile page. The images must be to the specs listed. Formats: .gif, .png, or .jpg. Transparency: If you want your avatar to blend in with the background then use a white or #FEFDF7 (R:254 G:253 B:247) Web color for the matt. Smaller File Size: PNG-8 images tend to be a lot smaller file size than GIF and JPG images. By allowing you to upload your own avatar I must ask you to use discretion to keep the images friendly and not to use any images that would offend fellow board members. To add your own avatar simply login and go to your profile page and scroll down to the avatar section. How can we get OUR Chows in the Avatar library? I've tried to upload according to your instructions but only get a red X - no pic. Yes. I too am having the same problem as Joe & Robin. As you can see, there is currently a red x as my avatar. Please advise as to how to fix this. Sorry... one more thing, once submitted, if the images are available on your avatar gallery, is there a way our personal avatars can be filed as "member chows"? Lou wrote: Yes. I too am having the same problem as Joe & Robin. As you can see, there is currently a red x as my avatar. Please advise as to how to fix this. That might be one reason why its not working. Lou wrote: Sorry... one more thing, once submitted, if the images are available on your avatar gallery, is there a way our personal avatars can be filed as "member chows"? Unfortunately PHPBB does not feature a custom member avatar galleries. If you like, submit your avatar to the Avatar Submissions forum and I'll add it to the avatar gallery. This will allow you to select it as your avatar, but it will also allow anyone else to use it. I did not upload from a URL. The profile page says I can load via my machine after we browse. That's the process I used for the avatar submission. So I guess I should use the same process to upload an image on a post to upload a personal avatar? Please advise. That should be fine. Was your image 6k or smaller? if larger then it won't accept it. and 80x80 pixels? and a .jpg, .gif or .png? So I thought it would go through and work out. Perhaps it is too small now? It should be fine. E-mail me the image and I'll do some testing to see what the problem is. After doing some test I found that there seems to be some issues with PHPBB and my server. I'm not quite sure why, but I'm gonna have to look it up. In the mean time I found out that the Link to off-site Avatar works. That means its getting the photo from a URL online and it always calls that URL every time the photo is accessed. 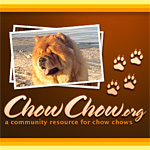 I did add the photo to the avatar gallery under Chow Chows. You should be able to access it from there. I am getting the red X too.. I uploaded from my computer. the pic is 80x60 and only 2.31 kb Help please Just in case here is a link to the pic. Thanks! I created a new category in the avatar gallery called Members which will contain all the member submitted avatars. Since allowing members to upload or link to their avatars is having problems I'm gonna disable it. So for people that want to have their custom avatar added to the Members avatar gallery will have to submit a photo and request in the Avatar Submissions forum. Your photo was added, you can find it under the Avatar Gallery under Members. Thanks so much! Please tell me if you require Judy to send or request this directly to you via e-mail; or if my link doesn't work, I can send it to you via e-mail. I added it to the members avatar gallery. Its a bad photo, too blurry, I tried to sharpen it a bit. If she can post a better quality one or the original I'll edit it for her and add it to the avatar gallery. Same goes for any photo to be submitted. Its takes me a minute to correct and improve the quality of an image that is submitted, unless they are pretty bad to start. Just to make sure I follow the thread of emails correctly. I need to submit Mr. N's picture to the "Members" avatar. I tried to submit one to the gallery today and the current image block shows the red X. You can send it to me and I'll add it to the avatar gallery. Simply e-mail it to chowchow@chowchow.org. chowadmin wrote: I added it to the members avatar gallery. Its a bad photo, too blurry, I tried to sharpen it a bit. If she can post a better quality one or the original I'll edit it for her and add it to the avatar gallery. Thank you! Judy says she likes her girls' avatar. So we're cool! Yahoo! Thanks for putting Mr. Nahkohe's picture up for me. is this too big ? can you resize it for me if so ? I added the above photo to the Members Avatar Gallery. Could I please get this avatar added to the members gallery? Samorrathis wrote: Could I please get this avatar added to the members gallery? I added this photo to the Members Avatar gallery. Can you add the image above to the avatar gallery please? Thank you.